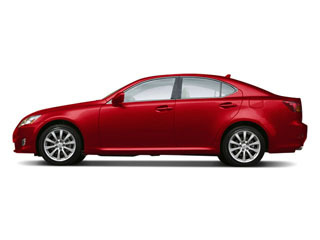 The 2009 Lexus IS 250 and IS 350 sport sedans bring the driving feel of a sports coupe, in a more practical four-door sedan body style, and have some available high-tech features that aren't offered by their head-on competitors. 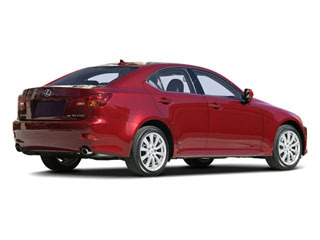 The Lexus IS comes in two primary models for 2009. 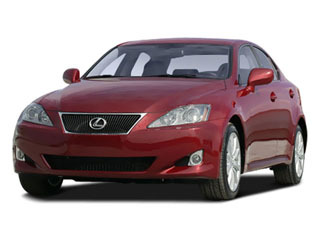 The IS 250 has a 204-horsepower, 2.5L V6 engine, and the IS 350 comes with a 306-horsepower, 3.5L V6. Both engines have aluminum construction and variable valve timing for intake and exhaust, along with direct injection. While those models are rear-wheel drive, there's also an IS 250 AWD model, which adds all-wheel drive. The IS 250 has a standard 6-speed manual gearbox with an optional 6-speed automatic with paddle-shifters. The automatic is standard on the IS 250 AWD model and on the IS 350. The IS 350 has particularly strong acceleration and will scoot to 60 mph in only 5.3 seconds. Electronic stability control, which helps restore vehicle stability by applying the brakes at individual wheels, is standard on the IS 250, while the IS 350 gets the more sophisticated vehicle dynamics integrated management (VDIM), which integrates all of the vehicle's electronic management systems, such as the anti-lock brakes and electronic power steering system, for more seamless assistance in maintaining stability. Eight air bags are standard on the IS, and there's also an optional pre-collision system (PCS) that retracts front seatbelts and readies brake assist when its sensors anticipate a collision. Other high-tech options on the IS include dynamic radar cruise control, which is packaged together with PCS, high-intensity discharge headlamps with an adaptive front-lighting system (AFS) to help illuminate into corners, and an intuitive park assist system for gauging the distance to adjacent vehicles. 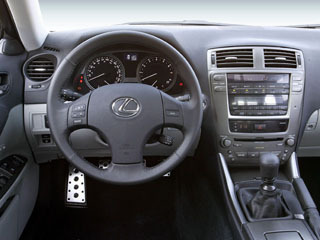 There's also a DVD-based touch-screen navigation system, a premium audio system with a 6-disc changer and 13 speakers, or the top-of-the-line Mark Levinson premium surround sound system, which has 14 speakers, 300-watts, and ten amplifier channels and can play DVD movies when the vehicle is stationary.